For many Americans, the idea of traveling to Hanoi brings a certain level of mystique. Our media exposure to Hanoi has been primarily press corps following politicians such as John McCain, or via the occasional human interest story that pops through via an international cable channel such as Current TV. But for most Americans our memories and images of Hanoi are from the war, whether it is a photo of Jane Fonda gracing an anti-aircraft weapon, or the prisoners of war being released from custody. Or maybe Vietnam has simply fallen off the charts as an area of interest, while the world focuses on other areas considered more important such as Afghanistan and Iraq. Citizen journalists may serve an important function in locations such as Hanoi. With an estimated population of nearly 6.3 million, Hanoi is far from a small town, and estimates are the city is growing at about 3.5% a year. The potential of Hanoi, and all other areas within Vietnam as an economic factor within the next decade is daunting, as the government aggressively tries to bring Vietnam into the modern global community. Having completed a series of meeting in Hanoi, I had a day and a half of free time to look around and experience the city. During this time I probably took 2000 photos, interviewed a handful of Vietnamese and foreign expatriates, and walked freely through city streets. Not once was I questioned, cautioned, or otherwise threatened in either an official capacity, or unofficially by residents of the city. Along with me were large gaggles of European tourists, mainly of the backpacker and “walk-about” variety. Most were frantically snapping away with their cameras in the Hanoi “Old Town,” and like me appeared to be traveling freely, without any level of distraction. In short, the government made no attempt at preventing anybody in my limited experience from recording any level of reality within the streets of Hanoi. Hardly the restrictive government some media outlets would lead you to believe. Or maybe that is American media outlets. Thus, while walking around Hanoi, talking with people and indulging in moments of sensory absorption, Hanoi is in a period of rapid reconstruction. The horrifying examples of aerial electrical and telecom cabling currently hanging in the streets are being replaced with buried cable. Superhighways are being constructed, and Internet diffusion into the education system is a very high priority with the government. 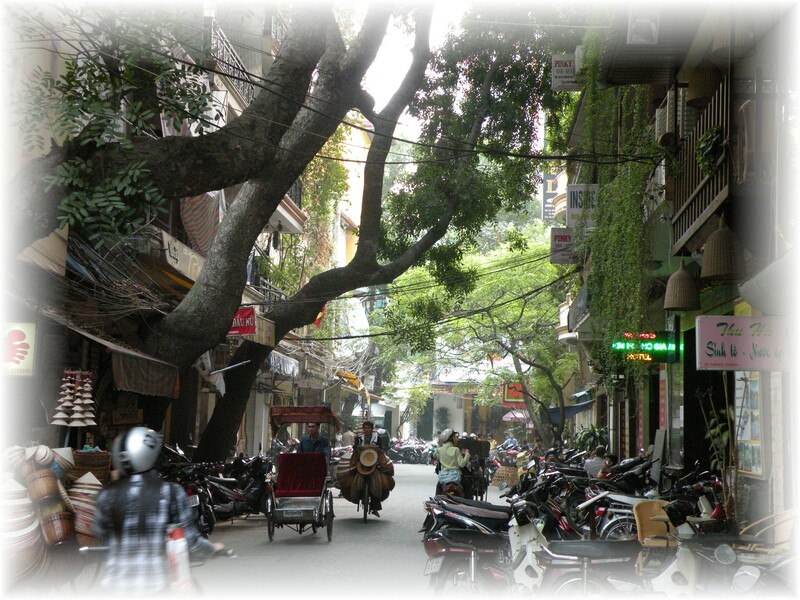 In 20 years much of old Hanoi will be replaced with a modern city, much as Beijing has gone from a city of Hutong (old-style brick structures), horses, bicycles, and scooters to a modern city of high-rises, Audis, and Starbucks – Hanoi will go through a similar modernization and conversion. The levels of CO2 spewing from legions of scooters will be replaced with modern transportation, and the city will be unrecognizable from the Hanoi of today. The history of Hanoi, from the Mongols, to the French, to the Japanese, to the Vietnam of 2009 will also fade with globalization and the facelift of modernization. Thus the world in general has had some misgivings on the value or integrity of citizen journalism, or when amateurs become reporters. The other argument is that citizen journalists only record facts, and others may interpret those facts based on their in-depth knowledge of the subject matter, or the spin which will further reinforce their objectives. In reality, experience is beginning to show that for a majority of “amateur” journalists the intrinsic reward of presenting a story or record of events in its purest form is far more fulfilling than using their effort for purposes of propaganda or an intentional misrepresentation of events. Thus the raw footage of riots and emotion in the streets of Tehran following the recent elections – those recording the events did not analyze, they simply transmitted events to the world as quickly as possible to ensure the history was not lost. The final factor is that in a city like Hanoi, people concentrate on their daily lives, with little regard to something as small as the power company digging up a sidewalk to bury high voltage power cabling. When you are concerned about your children getting to school on time, you do not concern yourself with mobile phone transmission towers being placed on a nearby building. Highway construction is more of an annoyance than a historical event. Thus, the outsider brings value to the preservation of history. When we as senior citizens want to remind the youth of our struggles during war, poverty, or explain the days when we actually chopped our own wood for cooking fuel, without a record of that history a child who lives within a future generation of the iPhone will have difficulty understanding how their life evolved into an environment where any child in Hanoi is a full-fledged, card-carrying member of the global community. CNN or Fox News cannot provide the bandwidth needed to bring both fact and analysis. Americans should have the opportunity to see the real Hanoi, not the Hanoi brought to us in novels or drama dwelling on the pain and history of war. The Vietnamese know there was a war, Americans know there was a war, and of course we cannot afford to let history slip past. But we also cannot hold a 12 year old student accountable for the human tragedy experienced in previous 500 years of history – we can only welcome the student into the global community of 12 year old students who will lead the world in a few short years. Without citizen journalists presenting communities like Hanoi to the rest of the world, the youth of Hanoi may carry an unreasonable burden to “prove” themselves. In Hanoi, the government has offered no restrictions on recording the Hanoi of today, and hopefully a corps of citizen journalists will ensure events are recorded through interviews, impressions, visuals (photos, video, sound), and not lost to the dark age of history. And with luck we will have a similar article in the near future talking about Palestine, Afghanistan, North Korea, and Iraq.